There are many jokes based on the premise of a whistle player and a tuba player, few of which are repeatable. However Red Hippo, who visit Wainsgate Chapel on Sunday October 14th for the final concert of the season, are based on just that bizarre combination. The band comprises three of the best musicians in the Calder Valley who play stunning mix of instruments including sousaphone, Irish whistles, saxophones and strings, and explore a musical world influenced by traditional folk music with jazz influenced arrangements. Although having known each other for many years, Peadar Long and Daz Jones had never played together until last summer when ended up busking together at Whitby during the Folk Festival. From this happy accident, Red Hippo was born. Aware that the novelty of the whistle and tuba combo might be limited, they were then joined by local hero Simon Chantler on fiddle, guitar and mandolin. Red Hippo also uses saxophones, bagpipes, flutes, acoustic bass guitar and sousaphone. Using Peadar’s eclectic jazz-influenced arrangements, Red Hippo create a musical world influenced by traditional English, Irish and Swedish Folk melodies, often underpinned with “a few posh chords” - as Peadar puts it. Red Hippo were then invited to support Folk Heroes and veterans The Oyster Band at Towersey Folk Festival and have since gone on to support LAU, winners of the BBC folk awards, at Hebden Bridge Trades Club. Peadar Long has a distinguished career in the folk and jazz worlds: with the award winning- Kitsyke Will, local jazz legends Tongue and Groove, and his own compositional work Celestial Echoes. One of his most fruitful collaborations has been with renowned international composer and pianist Dave Nelson. 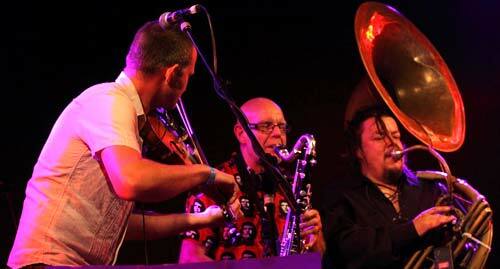 Daz Jones has played with The Last Chance Saloon Band, world-beat combo The Real Macaws, irreverent troubadours The Skiband, and with Skavolution - the UK’s only acoustic ska band. Violin, guitar and mandolin player Simon Chantler is best known for performing with legendary folk-punks The Whisky Priests, and now plays in several other bands including A Rookery, Shinjig and Kelly’s Heroes. The concert starts at 3pm, and tickets (£8/£6 and £2 for under 19s) are available on the door. Wainsgate Chapel is on Wainsgate Lane, Old Town, Hebden Bridge HX7 8SU. Parking there is limited and reserved for disabled drivers. There are plenty of footpaths for those who’d like to walk from Hebden Bridge or there’s an hourly bus service to Old Town Mill Lane (opposite Wainsgate Lane) where parking is also available. More information at about the venue and future events can be found at www.wainsgate.co.uk.